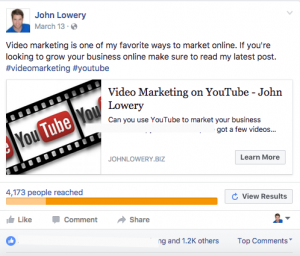 A few years ago I began to boost my posts on my Facebook Business Page. Not because I really wanted to, but because I figured that with around 10,000 followers at the time it was apparent to me that only 2 to 5% of my followers were going to see my posts. When I first got on Facebook back in 2008 it was not uncommon for most of your followers to see your posts, but nowadays that just doesn’t happen. I think it is even worse with the Facebook Business Pages vs. The Facebook Personal Pages. So which posts do you post and so forth? I would recommend anything that is business (marketing related) be boosted straight away. You can do this for as little as $15 per week ($2 per day per post). If you’d like to do a boost on a non-business related post where there is no call to action than only boost those posts that are getting a big response rate (Facebook will actually send you a notification). Keep in mind that by boosting your posts you are doing 2 things — hopefully getting someone to opt-in to your email list if you are doing a marketing post (always post links to take people to a squeeze or capture page). And if you are boosting posts that don’t have a call to action (non-business) you are doing this to either get more engagement or more followers. Since this can be a bit costly to build up your online presence over time you need to know pretty much what it is you are after before you boost your post. You also need to set aside a budget. You can start with as little as $60 per month. I would recommend test marketing in the beginning and stay on top of it every few days, so you don’t spend too much too soon. I personally always target my posts to audiences whom I feel would be most interested in the post. For example, if the post is about cold calling on the phone, I may reach out to salespeople, realtors, or network marketing professionals. If the call to action is for weight loss products, I would probably reach out to people who have expressed interest in weight loss products. Or if I’m promoting plumbing services, I’m only going to reach out to people in my local area. Once you know your market, you can have lots of fun with boosting posts and get a lot more traction than you can with a non-boosted post. It’s the difference of having only 100 people see your post or up to a 100,000. If you’re looking to get more followers never boost your post to your existing audience, always target new people outside your existing network. If you are looking to get more sales or expand your email list than it’s perfectly ok to just simply boost your post to your existing followers. When you click on the boost your post button it will allow you to pick geographical areas (globally), interests, and/or if you just want to post to your current followers. Hope this helps, you get more sales more followers and grow your brand on Facebook.